Dallas loves boy toys and movies. However, he also really loves girl toys and girl movies. We’ve gone through a Tinkerbell phase, a My Little Pony Phase and are currently storming a Barbie phase. He is just into characters and drama. 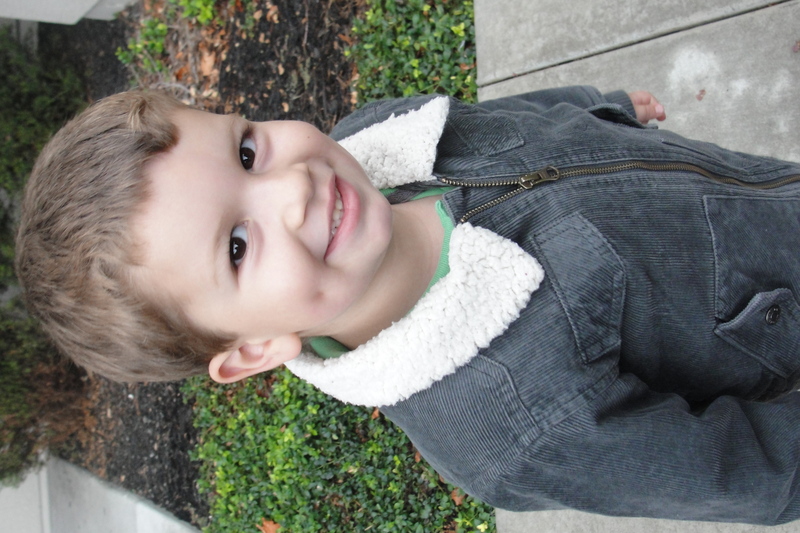 Maybe he’ll get into acting someday, he has the dimples for it. So now you’ll understand when I say the two boys and I were watching Strawberry Shortcake yesterday. Strawberry’s motto is, “If something doesn’t go the right way, improvise.” Or something close to that. Today, when the Cinnamon Date Bar recipe didn’t quite go my way, I improvised. 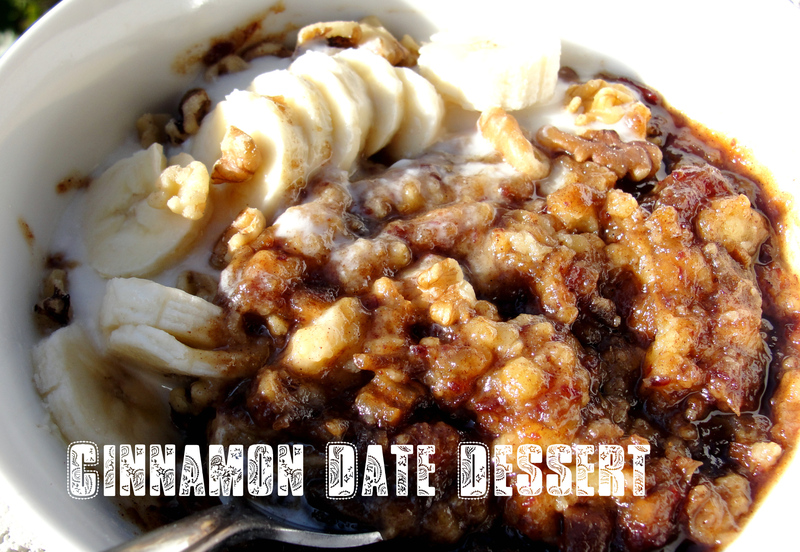 What you’ll now see is Cinnamon Date Dessert. This recipe was printed in the San Francisco Chronicle on October 30th, in the food section. It comes from the book, “Maman’s Homesick Pie,” by Donia Bijan. Her story and recipes recall Donia’s childhood in Iran and the recipes that remind her of her mother. Maman sounds like a gal that has plenty of time on her hands to roll dough, grind spices and finely chop dates. I ain’t that kind of maman. I had about an hour to do it all. Which, if you read the recipe will see is about the time needed for the dough to rest. I was able to let the dough sit in the fridge for about 12 minutes while I cut the dates and brought the brown sugar mixture to a boil. I grabbed a casserole dish, layered the dough, date mix and more dough, then baked for 10 minutes. Date bars in a flash. Or uh, kinda. To make the dough, cream the butter and sugar in a mixing bowl until pale, about 2 minutes. Add the egg, egg yolk and vanilla, mixing well after each addition. Add the flour and salt, and mix just until the dough comes together. Turn the dough out onto a floured work surface and roll into a ball. Wrap in plastic and chill at least 1 hour, or overnight. On a well-floured surface, roll half the dough into a rectangle about 10 x 14 inches. The dough is crumbly, so patch it together with your fingers if needed. Roll dough carefully up onto your rolling pin and then unroll it onto the baking sheet. Brush with beaten egg. Spread date filling evenly down the center and out toward the edges of the dough, allowing ¼ inch on the edges for sealing. Roll the remaining dough into a same-size rectangle. Roll it onto the rolling pin and unroll it directly over the dates. Press gently to seal edges. Trim edges and brush top with beaten egg. Using a fork, lightly poke top layer of the dough to make vents. Refrigerate 20 minutes. Sift together powdered sugar and cinnamon over the date bar before placing in oven (I just sprinkled mine with granulated sugar and forgot the cinnamon). Bake at 350 degrees for 15-20 minutes, until golden brown. Remove from the oven and cool on the baking sheet. Slice into 2-inch bars. Come back tomorrow to see the next installment of Movies & Meals. It is going to be a fun one! Here’s a hint, it started and ended in 1998. Curious? Good!